The first article in this mini-series on creating geolocation apps with the backend hosted in Windows Azure Websites is going to be a walkthrough of the PHP code that we’ll host in Windows Azure. The PHP site will be simple and expose just a few methods. 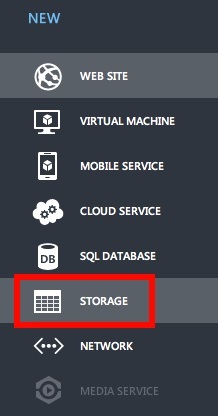 Prior to getting into the code for the service, we need to setup a new website in Windows Azure and set up our database. 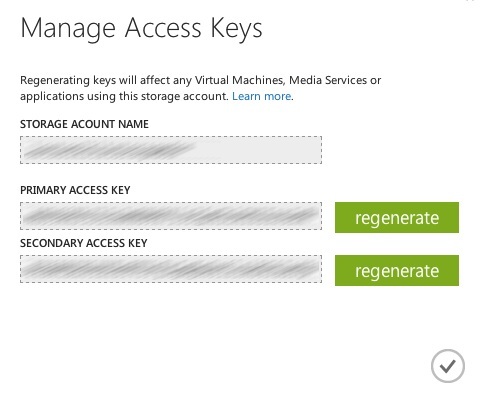 If you don’t already have a Windows Azure account, you can sign up for a free trial here. After that, you'll need to request access to the Websites preview feature here. If you want to bypass the whole below tutorial, you can access the code for the PHP site in GitHub. Let’s get started. Once you’ve created your account and signed up at http://manage.windowsazure.com, log into the portal. From there, go to New at the bottom of the screen and pick website. 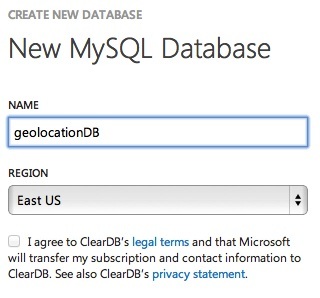 After hitting next, you’re given the option to name your database and choose a region for that. Make sure the region of your database is the same as your website. Since they’ll be talking to each other, you don’t want them to have to leave the DC. Either remember where to get that or copy it down for later. Now it’s time to set up Git publishing for your site. At the top, go back to Dashboard. 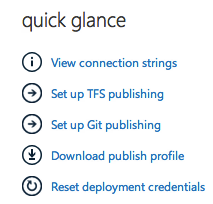 On the mid-right, under “Quick Glance” you should see “Set up Git publishing”, click that. The page will say “Creating Git repository” for a few moments and then, it will finish and show you some important info. The first thing there will be your Git URL, followed by instructions on installing Git. Lastly, you’ll see how to create a local git repo wherever your files are and then how to add your new Windows Azure Website as a remote endpoint. 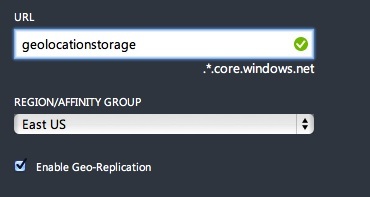 Note that if the directory you have your files in is already a Git repo, you can (AND SHOULD) skip the “git init” step and proceed directly to adding the remote Windows Azure Git Repo to your existing repo. Once that is done, you can pull down this PHP code from GitHub. You can either download the zip or clone the Git repository locally. You’ll need to copy the contents of the source directory to a new directory so you can set up a proper git repo locally later on (since Git will treat the code you pull from github as it’s own repository, we want a new one with just the contents of source). You can host this website locally if you choose to, but it isn’t necessary to proceed. Before we configure the site, we need to download one third party library. Now follow the instructions for setting up your git repository locally (remember these showed up after you went to “Set up Git publishing” above. One thing to note is that if you haven’t set up deployment credentials yet, you won’t be able to push. Click the “Reset your deployment credentials” link at the bottom of the Git web page and after that you should be fine. Now when you go to your site (if you didn’t copy down the URL, go back to the dashboard in the Windows Azure portal and it will be on the bottom right) you should see the text “Hello geo home”. This is the only visual display our site really does. Everything else is behind web methods. There is one more step we need to complete before we dive into the code, and that is to set up our MySQL database. Your response should be something like “Query OK, 0 rows affected”. Your table is now created. Now we can look through the functionality that will power our mobile applications. This method just calls into the storage account to set up a container for blobs to be uploaded to. You MUST call this method (via the browser is fine) before you’ll be able to upload any blobs from the mobile clients. The way that uploading blobs work is that a blob goes inside a container. A container can have many different blobs. The mobile app code we’ll go over in future articles relies on a storage container named “test” so going to this URL will create that container so when we get to the mobile apps, it will be ready to go. 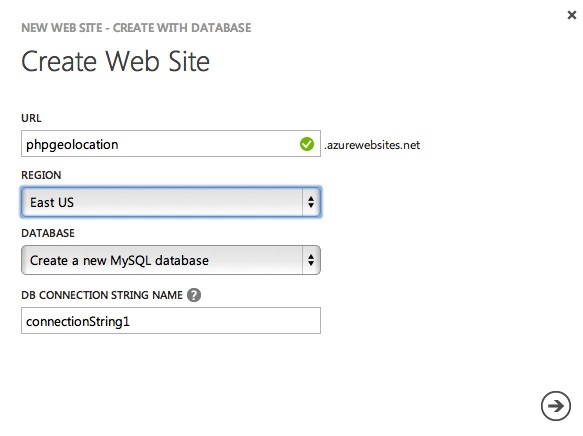 Just remember, prior to working on the mobile apps, change this URL to match your site’s subdomain and view it in the browser: http://yoursubdomain.azurewebsites.net/api/Location/AddTextContainer. If it is a success, you should see a “Container created” message. You’ll only need to go to this once. If you look at the root folder of the source code, you’ll see a folder there named OldSDK. The reason for this is that, at the time of writing, the new PHP SDK for Windows Azure did not have hooks for connecting to Windows Azure Storage. The previous SDK did, however, have access to storage. At some point I’ll update the code base and this tutorial to use only the new PHP SDK. Today we walked through creating a new Windows Azure Website, configuring a PHP website, and uploaded it to Windows Azure. We also looked at the code for this site which we’ll rely as a backend for the next few articles which will focus on creating mobile apps that connect to the service running in Windows Azure Websites. As a reminder, you can get a free trial for Windows Azure here. do i have to use git for this to work? I have tons of problems using git. I dont know how to get the proxyusername or the pwd nor the server and i cant do "$mysql --host=hostname.cloudapp.net --user=userName --password=password databasename" i type " --myDBname.cloudapp.net" and it tells me command does not exist. When i try git push azure master i get an error with the proxy. $mysql --host=hostname.cloudapp.net --user=userName --password=password databasename"
i downloaded an sql server but i can use "--host=hostname.cloudapp.net --user=userName --password=password databasename" it would save me tons of time on the internet searching, thanks. found the answer. The ' at the back of a variable should be `. it just gives me a blank white page, i tried with a php i created it seems to work fine with that one. It's been quite a while since I first posted this so I can't guarantee everything is still accurate but I'm not sure why it wouldn't be working. I would look at the log files to see what might be happening.